While the silly season is over (and thank goodness for that – I anticipate it will take me a good couple of months to recover!) summer feels like it’s just ramping up. Here in South Australia, the mercury has already topped 44°C and brought with it an awful and devastating bushfire and we are facing some more scary (that’s “hot”) conditions this week. 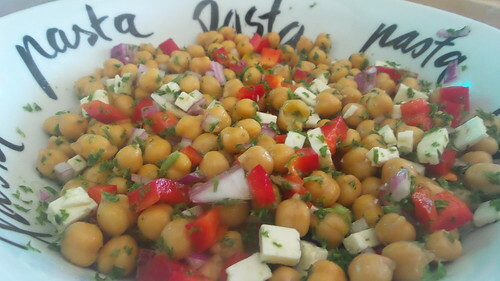 This very easy chickpea salad is a perfect dinner in its own right on a hot night, or an ideal accompaniment to a BBQ. It’s also very flexible. At some point I read about a chickpea salad but I failed to find the recipe. However, a quick google reveals a ton of ideas. I think avocado would be a brilliant addition to this salad but in order to maintain a bright and colourful appearance you would have to add it at the last minute. This was no good for me as I was taking this to a New Year’s Eve BBQ and needed it made in advance. Add in any fresh herbs you have access to – I was intending to use mint from the garden but forgot (which I now regret, as the mint suffered during the heat). Consider the recipe that follows a bare-bones starting point and flesh it out as you wish. If you have fresh, warm, sunkissed tomatoes from the garden, why not add those? Work with what you have. In cooler months, tossing through some roasted vegetables such as pumpkin or courgette/zucchini could work well too. For the dressing, I used some Cobram Estate chilli infused oil which I was given as a Christmas present. This gave the salad a lovely, warming chilli kick without being over the top. I have not been a big user of flavoured oils in the past, but this one definitely gets a bit tick from me.